FRIDAY: 2 patients and 2 chaperones shuttled to the Bongolo Hospital! It was a bit surprising, but the passengers covered the operational costs of it all! It was a bit last minute, but, as we get our air evacuation op's up and going, we’ll see more and more last minute flights and need to be prepared. Every half hour I document readings of oil pressure & temp, fuel flow, cylinder head temp, exhaust gas temp, etc. This is thanks, mainly, to a great little engine monitor called a JPI EDM-700 (see picture). We’ve been seeing really uniform readings. We’ve got a great machine. I’ve rotated in some fuel that was purchased previously with recently purchased fuel. Filtering is done with every single drop that goes in the tank. I’m really watching the fuel quality/handling issues. So, the blending of fuel is all done in the right wing tank of the aircraft in keeping with standard op’s from many mission aviation org's. In this way, for critical times of flight (takeoff/landing) the left tank is used. During cruise, the right tank is burned. Also- never less than 10 gallons in any tank at any given time- over twice what Cessna calls “unusable”. 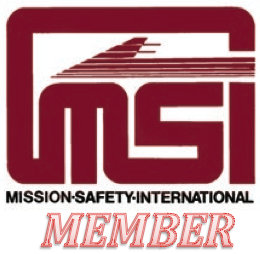 This is in keeping with MSI’s prescription. In all, it’s working great. 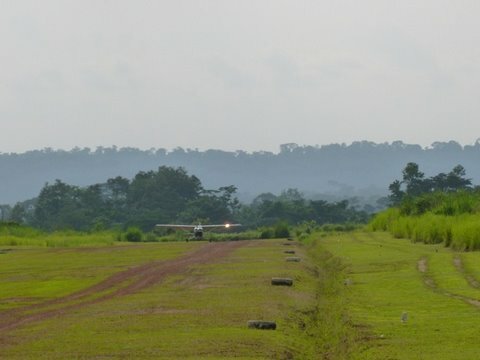 I was in Nigeria on Monday and Tuesday helping my German friend, Egmont, and his agricultural company that had their 2nd aircraft stuck there. 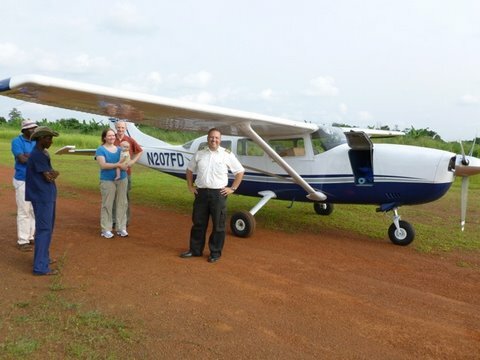 So, he flew us up there in their cool twin turbo prop (a Piper Cheyenne), we stayed the night, and then the next day I flew their smaller twin engine aircraft (Beechcraft Baron) back to Gabon (over the Atlantic for some of that). That's the update for now! I'll be posting all of January's stats in my newsletter (sign up your email on the right to receive it). So, thanks to the hard work of the guys at the Lebamba airstrip (Bongolo Hospital airstrip), our airplane can get to the hangar! 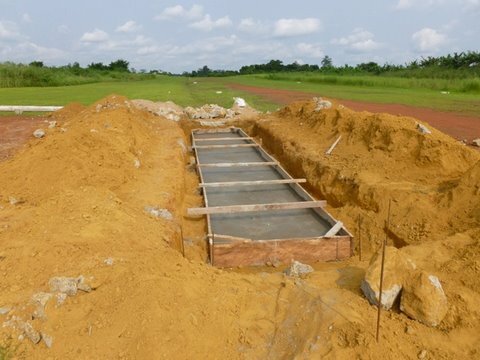 A nice, new, larger culvert will now help in solving the erosion problem we were having across the runway. A special thanks to Dr. Thompson for directing this project! Here's where we have been parking for the last year or so- right on the grass strip. ... into the hangar! 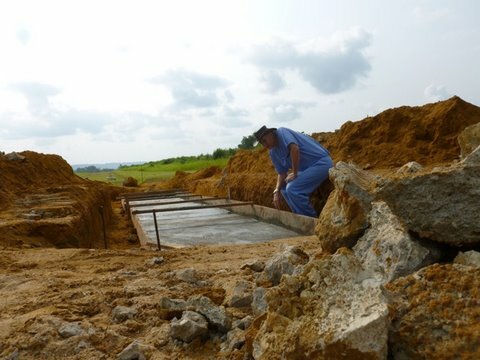 To the right is our project foreman, Andre'. The aircraft fits snugly- only a foot and a half clearance on either side. And now, thanks to an enhancement from our Bongolo team member, Paul D., we can have some water and give our aircraft a much needed bath! As you can see, the airplane had become nice and dirty. "Lavez-moi"- I suppose most of you can figure out what that means!?! My aircraft washing partner is Fidele. He has flown with me previously and was very happy to help me shine up the aircraft. With great optimism, first thing Monday morning, I moved into position at the front door of the civil aviation offices to get my document and slap down my $500 for 3 months of flight privileges. I had so much optimism that I had already pre-flighted the airplane, loaded in the luggage, medications, and medical equipment AND filed my flight plan! However... the waiting game that had started a week earlier resumed once I got inside the front door and was told that we were waiting on one last signature. I got to the office of the inspector to get a closer look and actually saw the flight permit document on the screen of a monitor! We're getting close! Then... the person that needed to sign the document left for a two hour meeting! UGH! This lead to 2 passengers cancelling- a sick young man and his chaperone. They simply didn't have the time to wait. This part was a bit sad. Due to the lapse of time, I had to void my original flight plan and later deposit another one. So much for optimism! However, I stayed at my post in the lobby of civil aviation and was there to welcome back the person whose signature we were waiting for. 20 minutes later, I was paying, getting the receipt, and taking care of loading passengers! WE HAD THE PERMISSION!!! I entered in our destination on the GPS to "LEBAM" (Lebamba) and followed the straight line! Here we are passing over the Ngounie' River near the village of Fougamou (a word that is fun to say... and the name of one of our cats). Our passengers were very happy (some were drousy!)! Dr. Loua R. is next to me- he is a surgical resident in the PAACS program at Bongolo Hospital. In the back seat is the Hofman family. Wendy is the ophthalmologist at Bongolo and also runs a training program. Behind our passengers is sensitive equipment for the hospital that would not survive the trip by car. "During this flight to Bongolo, AMB transported two pieces of equipment that are very important to the functioning of the eye clinic. One of the pieces is an indirect ophthalmoscope which had just been repaired in the US and allows the doctor to examine the retina inside the eye to help diagnose and treat diseases that manifest there. The other piece of equipment, which was also just repaired in the US, is an autorefractor and autokeratometer, which allows us to calculate the power of the lens implant that is placed inside the eye during surgery after the cataract is removed. Without this piece of equipment, we do not operate on cataracts at all, because the right lens implant is essential to achieving good postoperative vision. Since we now have this apparatus, we will restart surgeries this week." This is the "serious" look from the cockpit, along with my SPOT flight tracking device. It showed that it was sending out good signals, but later the online display only showed three "hits"- I'm looking into that. A hazy day with some clouds to dodge. A small village in the rain forest of Gabon. 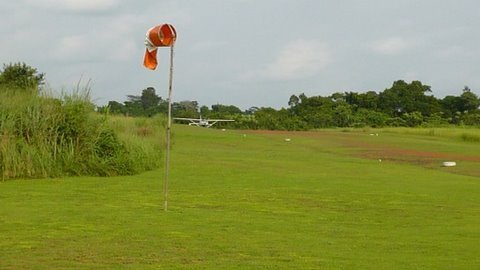 After an hour and forty minutes and a quick buzz over the Bongolo Hospital, we were lining up on final approach for runway zero-nine. Back taxi to the reception area. Back on terra firma! 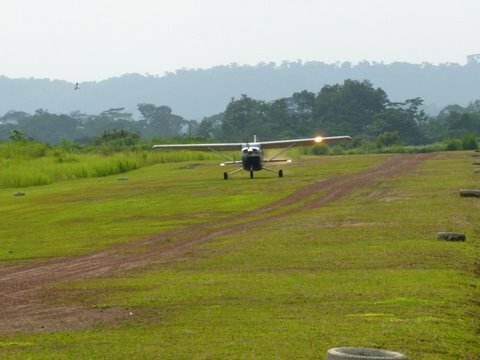 It has been quite a while since N207FD had visited the Bongolo airstrip. 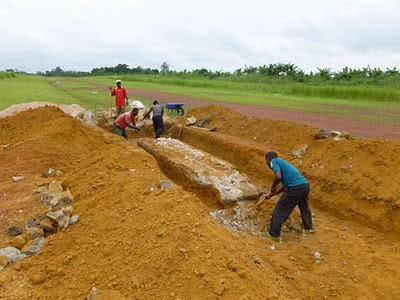 We are having some erosion control work done on the runway, so we had a nice welcoming committee plus Dr. Thompson was there to gather the passengers, take photos, and return to the hospital with Paul D.
A lot has been happening with the airplane- its' arrival in Libreville and the race to get all the permits and start to fly. While all that has been happening, work on the Lebamba airstrip at the Bongolo Hospital has been happening. Last year, the government inspector said that he wanted to see some work to curtail the erosion that was happening on the strip. This is a photo from December of 2009. You can see the erosion issues that we were facing across this culvert. 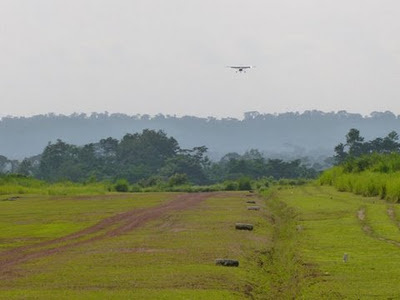 Our aircraft uses this crossing to pass over the drainage ditch to get to the ramp area. It became so bad that we used sandbags to control the erosion. So... we needed a longer term solution. So, Dr. Thompson put together a plan and hired a crew to get it done. 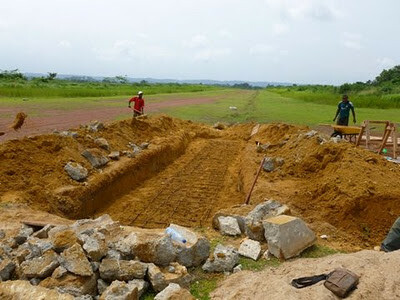 Phase one was destroying the existing culvert. Then it was on to laying down the rebar and pouring cement. Here it is formed up. It's about twice as long as before and will handle quite a bit more of the runoff- keeping it from exiting across the runway and eroding our surface there. Here's our project director in action! He's sporting his "Indiana Jones" look! Quality control is a big part of the job. 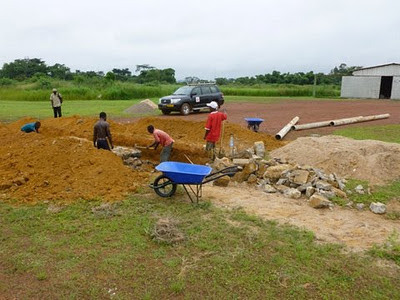 We are thankful for Dr. Dave's oversight to this project, our local workers, and Paul D. who is giving time away from maintaining the Bongolo campus to provide supplies and logistics to this effort. For the aircraft's first week in Libreville, we took up residence in an unused hangar. The lease for this hangar is up for renewal, so we benefited from some ambiguity while we took out the additional reservoir tanks and did some odds and ends. Speaking of odds and ends... the extra fuel tanks that were used had been connected via a "T" fitting into the fuel lines under that pilots' and co-pilots' floor board. It was not easy to reattach those fittings, but with the encouragement of Joe and Sam (who were playing basketball inside the hangar), we got 'er done. This past week, I scheduled the inspection from the Gabonese civil aviation offices. The aircraft was pulled out on to the ramp area. The inspectors came to the aircraft a total of 3 times. The last time we ran the engine and did operational checks of the flap system, avionics, and braking. 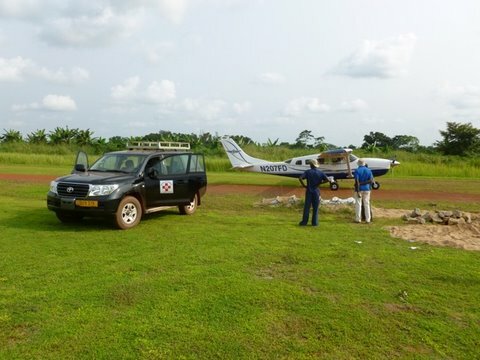 The aircraft, in this photo, is sitting in front of a hangar that our aviation support group would like to see get turned into a base of operations at the Libreville airport. Since the hangar can only be accessed by smaller aircraft, it is a great fit. Please pray for approval from the airport authority! Until we find a home to hangar our aircraft, this is where we'll be parking- between two, defunct, "Dash 8" regional airliners. By the end of the week, after 3 visits to the airplane and many, many documents handed in, civil aviation was still asking for more. They had given me the impression that everything was fine on Friday morning, so, in the afternoon, I came to their offices around 3pm and literally stood for 2 hours in front of the receptionists desk, waiting for my document that gives me authorization to fly in Gabon for the next 3 to 6 months. Finally, one of the inspectors emerged from his office and called me back. He told be he still was not happy because our aircraft still had the same engine on it as it did when we had our forced landing in 2010. I explained to him that the loss of power that led to that event was not a problem that originated in the engine, rather, it was the fuel system. I reminded him that the engine has powered our aircraft through the "return to service" flights in the US as well as the 46 hours of flight that brought it from the US, over the Atlantic Ocean, to Gabon. So, he asked that I create a document outlining these things, and bring it by on Saturday- he assured that he would be working. So, frustrated, I returned home to try and enjoy my last evening with Alace and the kids before they set off to Cameroon to get back to the spring semester of school. Saturday afternoon, I dropped off the document they wanted. They assured me that my flight authorization is all written up and ready to go. I told them that I will need this as soon as their office opens on Monday because our first flight to Bongolo Hospital is set for that morning. Please pray with me that this document will, indeed, be ready and that our 10am departure from Libreville to Bongolo can happen. Taxiing to park at the final destination from a long, long trip! 49 flight hours over 8 days from Kansas to Gabon! After applause from the crowd, John crawled out from the cockpit to be welcomed by me (center), and our good friend, Egmont. Our family, plus John and Egmont. We are so blessed by John's service to us. I assure you that I am Alace's favorite pilot, but tonight... John was a close second! As much as John loves to fly airplanes, he was very happy to be at his destination and be greeted by so many thankful people! We are truly grateful for him. One of the avionic tech's that worked on my airplane left this little gift for me in the airplane. An inside joke about an emergency landing 20 years ago when I was a back seat passenger in a flight school airplane that ended up striking a cow in a field. The welcoming committee was out in full force! I'm really surprised that the airport police didn't shut us down. We were taking so many pictures! Here's a shot of the three guys present with "the right stuff"! A small token of our appreciation to John for his great skill and bravery in transporting this small aircraft over oceans, deserts, and land, from one continent to another. Another gift for John's company- Weaver Aero. It's an "Mbigou" stone carving of our organizations logo. This stone is from the ground, here in Gabon, and is good for carving into great shapes. Thank you Weaver Aero for your great service to us! When asked for a comment... I was speechless! "Glory to God" was all that I could muster. What a great event this evening was. A prayer of thanksgiving and dedication. ...and a special blessing from our business agent and friend, Pastor Sangoye! NOW we are ready to fly! Many of you joined us as we watched the "SPOT" tracker pinpoint the aircraft's location along the journey. We want to thank you for all your prayers, encouragement, and financial support. This is no small effort and could not have been done without many people joining to assist in carrying their share of the load. We thank you from the bottom of our heart. Words can not express how much you all mean to this effort and to our program. Merci beaucoup! May God richly bless you.